Disasters come in both natural and manmade forms and are always devastating to those involved. With that constant awareness of people's needs, when disaster strikes, The Salvation Army is often among the first on the scene. Our trained personnel are always available to meet emergencies by providing food, shelter, clothing and spiritual comfort. The Salvation Army's first aim is to meet the basic needs of those affected, both survivors and first responders (such as firefighters). For more information on Emergency Disaster Services, click on the links at the bottom of this page. 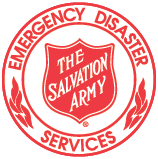 The Salvation Army's Disaster Services program began on September 8, 1900 when a hurricane devastated Galveston, Texas leaving more than 5,000 people dead. The city, sustaining extensive property damage, was virtually destroyed. While survivors were still reeling from this onslaught of nature, Frederick Booth-Tucker, National Commander, ordered The Salvation Army officers from across America to proceed to the disaster site to provide spiritual assistance. The Salvation Army's first national disaster appeal for funds was generously supported by caring Americans. From these beginnings, The Salvation Army has developed local, regional and national disaster services programs. Whether a local incident or a major disaster, The Salvation Army staff and volunteers are often the first on the scene and the last to depart, honoring a century-old commitment to serve those in need, at the time of need, and at the place of need. The Salvation Army disaster response teams, coordinated and directed by commissioned officers and trained personnel, supported by volunteers, are 'on call' to serve at all disasters and civil disorders which place a community or its populace at risk or which may disrupt or destroy family security and well-being. Over the past couple of years, our local Salvation Army officers have assisted with several disasters including the aftermath of September 11, 2001. We sent many volunteers, Salvation Army staff and officers from the Phoenix area to assist in the services offered after 9/11. However, our local Divisional Headquarters is well known for the disaster services that were given during the Rodeo/Chedeski Fire.